Katie Novak, Ed.D. is a school administrator, mother of 4 and author. 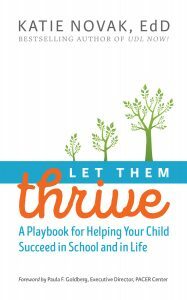 Katie wrote Let Them Thrive: A Playbook for Helping Your Child Succeed in School and in Life to help parents play an active role in their children’s education through informed partnerships with teachers, students and school administrators. Katie believes that all children are capable of learning anything if focus is put on evaluating teaching methods and ideals rather than limiting their ability to learn to antiquated assessments and practices. When it comes to kids adeptness at retaining and applying information, Katie presents the notion that one size does not fit all and teaching methods should be adjusted accordingly. Let Them Thrive is an important and must read book that forces parents and teachers to individualize the way we interact with our kids both socially and academically. Using the Universal Design for Learning (UDL) framework as its recommended teaching method, Katie equips parents and teachers with the tools they need to adopt the UDL framework and to give children options when it comes to learning. We are excited to include Let Them Thrive in our CEOMOM Book Club. Read our interview with Katie Novak, as she dives into the inspiration behind Let Them Thrive and provides tips for how parents can be the leaders in their children’s education. What inspired you to write Let Them Thrive: A Playbook for Helping Your Child Succeed in School and in Life? As an educator, I see the value (and the academic results!) of embracing all our kids exactly the way they are. When I walk into classrooms in districts who embrace personalized learning through UDL, I see kids who are motivated, resourceful and self-directed. They are thriving. This is because in schools where students are thriving, the systems have embraced a framework called Universal Design for Learning (UDL). The basic mantra of UDL is, “Our kids aren’t disabled or broken. Our schools are.” Because UDL is endorsed nationally, it drives me up the wall that some teachers and kids aren’t experiencing the power of that framework. There are too many kids who don’t like school or who struggle academically, socially, or emotionally and schools aren’t meeting their needs. It doesn’t have to be this way. For years, my lens has been trying to transform schools to help them best support their teachers and students, but the transformation isn’t happening fast enough. It’s time to turn out Team Momma, as together, we can make sure all our kids get what they deserve. I wrote Let Them Thrive to let parents know that every child has a right to a personalized education and we have a right to demand it. So, game on! What was the defining moment that inspired you to adopt the Universal Design for Learning framework? I became a teacher because I believe in the power of learning. I believe that any child, and any teacher can be wildly successful if we create conditions for nurture and we provide them with relevant, authentic, meaningful opportunities to learn. I believed this even when I was assigning the same book to the entire class and requiring them to write essays. I believed this when I gave long multiple choice tests that required students to memorize information that was at their fingertips on their phone. I simply didn’t know any other way to teach because I was taught that my job was to follow a script and teach a curriculum. When I first learned about UDL, I suddenly felt free to be creative, to provide options and choices for students to make their own meaning, and right away, their achievement soared. What are some practical ways parents can apply the Universal Design for Learning (UDL) framework at home? a. For life lessons: We have two rules in our house: Be nice to everyone you meet and work hard. That’s it. We tell our four little loves, “We don’t care if you get good grades, are funny, or are athletic.” When there are infractions, which there will be, it’s tempting to lay down a consequence, like taking away an iPhone or sitting down for a “family talk.” But remember your goal. For us, our goal is that our kids need to be good people. If your kids are mean to each other, have them troubleshoot. You could start with, “I know that you frustrate each other. It’s okay to be frustrated with people. Let’s talk about some options for how you can cope when you’re frustrated so you don’t take it out on each other.” Share the options that work for you and then provide opportunities to practice. For example, “Maybe deep breathing would help. Even professional athletes use it. Maybe we could grab a book about meditation or you could watch a video or we could sign up for a class together? Which one would work best for you?” You can see how together you can own a goal and consistently choose-do-and review until you figure out the strategies that work best. b. For academic lessons: If your kids attend a school where homework is assigned, it may be the bane of your existence. Kids come home exhausted and they want to lay on the couch, play with toys, run around outside, or just stare at the fridge and say, “Mooooom, there’s nothing to eat!” Now, we can require homework in a one-size-fits-all, traditional approach by saying, “You will sit at the table and won’t do anything else until you finish.” But UDL acknowledges that students need options and choices to meet goals. So, start off by asking, “What do you think would be the best way for you to complete your homework? Do you think it would be helpful to do it all at one time? Or should we break it up into tasks? Do you want to work on it alone or collaborate together? Would you be more comfortable sitting on the couch or doing it outside by the pool?” The possibilities are endless. Allow your kids to make a choice, follow through, and then check-in and reflect. “How did your choices allow you to meet your goal?” If they made a good choice – stock the fridge with something special. If they were off task, that’s no big deal. You can respond with, “No big deal. Now you know that’s not the best choice. Let’s try something else!” It’s all about teaching kids how to become learners! You list several ways parents can encourage schools to apply the UDL framework. What are some ways parents can manage resistance from school administrators, etc? As an educator, I believe that every educator is trying to do the best with what they have. If administrators are resistant, it’s because they haven’t yet learned why it’s important, what it is, and how to implement it. UDL requires a transformation of the system. It’s moving schools from being deficit-based (what’s wrong with our kids) to asset-based (what are the amazing strengths of our babies and how we can optimize their learning). Share articles with them or share books and if you still get push-back, call me. I can definitely hook you up with a UDL advocate, article, or data from my own district that will empower administrators to take the first step. I can promise you this – all administrators want students to be successful. When you can shape that path to UDL, they will be. How can parents partner with teachers in creating an effective learning environment where all 3 networks of the brain (affective, recognition, strategic) are activated? Teachers love parent support! Share what makes your child amazing and what they are interested in when you send a welcome email. Try something like, “My daughter Aylin is an amazing human. She loves art, playing the guitar and is obsessed with the Sharer Family on youtube. She lights up when you give her compliments and don’t be surprised if she brings you little presents like flowers and barrettes, because gifts are her love language. She loves when she is given options and choices to draw, create, and act out things and she’ll do almost anything for a sticker. I’m so excited that she gets to share the year with you. I’d love to know a little more about you. What makes you tick, and what’s your favorite morning drink… I may have to just stop by some time with a treat.” This not only helps the teacher to know what makes your child amazing, but you’re also activating their affective network and helping to motivate them. Also, if you want teachers to learn about UDL, you need to provide them with options and choices to learn more about it. For example, you could ask them if they prefer to learn through books, articles, or videos and then share a sample of resources so they can learn about UDL in their own way. Lastly, we want to ensure that UDL translates into action and that our kids have options and choices to learn. To do this, advocate for teachers to receive professional development in UDL because the best way you can support our amazing teachers is to advocate for universally designed learning for them as well. The power of learning, and UDL, will transform our homes and our schools and together, I have no doubt that mommy-power can make this a reality! Learn more about Katie and Let Them Thrive at http://katienovakudl.com. Click here to order the book!